WHERE: Emory University’s Glenn Memorial Auditorium, 1660 N. Decatur Road Atlanta 30322. Media seating is available at the front, to the right of the stage. 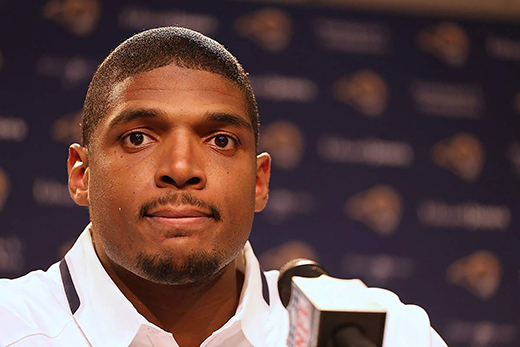 Michael Sam, an American football defensive end who made history when he came out as gay ahead of the NFL draft (making him the first openly-LGBT player to be drafted in any major American sport), will speak to Emory University seniors May 5 at 6 p.m. as part of Emory's 13th Annual Class Day. The student-organized event allows graduating seniors to hear from a well-known speaker of their choice. Note: The event is not open to the public, but media may attend. Since Sam’s announcement, he has become a noted figure in the LGBT community. Hailing from a small Texas town and the seventh of eight children, Sam had a challenging childhood. With a portion of his early years spent living in a car with his mother, Sam was determined to make a better life for himself, identifying sports as his ticket out. Sam secured a football scholarship at Missouri and was named a first-team All-American and Co-SEC Defensive Player of the Year. Predicted to be drafted early in the 2014 NFL draft, Sam was drafted by the St. Louis Rams as the 249th of 256 players selected, after he came out as gay during an ESPN interview. He is currently an NFL free agent. In 2014, he was named one of GQ Magazine’s Men of the Year, was a finalist for Sports Illustrated Sportsman of the Year and the recipient of the Arthur Ashe Courage Award at the ESPYs. The University’s central commencement ceremonies are Monday, May 9 at 9 a.m., and will feature a keynote address by William Foege, the renowned epidemiologist credited with devising the strategy to eradicate smallpox. PARKING: Media parking for TV trucks will be available on the left side of Fishburne Drive next to Glenn Memorial. All others should park in the Fishburne Deck visitor parking located at the end of the street at 1672 North Decatur Road Atlanta 30322. OTHER PHOTO OPPORTUNITIES: Class Day is the first of three events for Emory seniors. At the Class of 2016 reception from 7-8:30 p.m. at the Emory Conference Center Hotel, seniors will offer the traditional Coca-Cola toast. Following the reception, graduating seniors will take part in a ceremonial candlelight walk across the Houston Mill Road pedestrian bridge to Emory's Miller-Ward Alumni House. CONTACT: Media interested in covering should contact Megan McRainey, megan.mcrainey@emory.edu, 404-727-6167 or 404-409-0378, by 5 p.m. May 5.